This time of year, Santa is a pretty busy guy. Can you imagine how one guy flies all around the world, bringing toys to all the good boys and girls? How does he ever do it? Santa has a lot of work throughout the year to prepare for the Christmas season. While he does have his trusty elves to help him keep an eye on the North Pole Workshop, sometimes it just isn’t enough. Santa used to have to call the elves to make sure everything was running smoothly while he was away. Luckily, for Santa he’s discovered the benefits of Alarm.com! Alarm.com is a home automation platform that Santa uses to manage his workshop without having to really be there, all from his tablet and smartphone. One of the great benefits Santa loves is the fact he receives Real-Time Notifications and knows exactly what time the elves arrive and leave the workshop. This allows Santa to know that his elves have arrived safely, as the safety of his elves is his biggest priority. Better yet, it’s easy for him to use! As they arrive in the workshop there’s a Mini Wireless IQ Sensor on the door, that when activated, his Qolsys IQ Panel will send a text and and e-mail right to his phone! 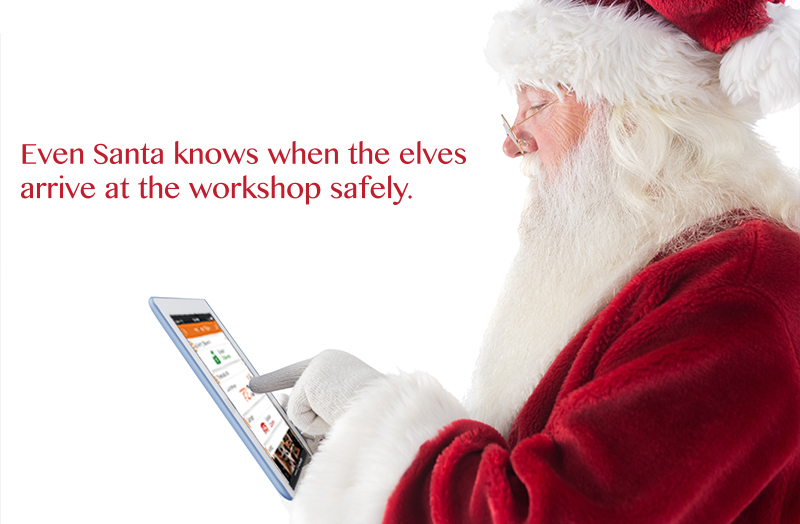 He can even assign a code to each elf, so Santa will always know who is in the Workshop! Another feature Santa really enjoys is the fact he has Energy Management, which allows him to control the usage of lights and other devices in the workshop with his handy IQ Light Modules. You wouldn’t believe how often the elves forget to turn the lights in the Workshop off! Of course it must be difficult to remember especially in the hectic days before Christmas. Santa even replaced his ordinary light bulbs with smart IQ Light Bulbs, so that he can control the lamps in the workshop from anywhere in the world. Santa’s power bill has even lowered 45-60% each month by using these energy saving bulbs! Santa loves the convenience of the Alarm.com app. The best part is its super easy for Santa to use whenever he needs to. With simple Remote Access on his tablet and smartphone, it gives him easy access to see and monitor everything going on back at the Workshop. Santa’s life has been less stressful by making technology his ally, therefore allowing him to the best he can be and delivering the ultimate holiday for all to witness and see. Not to mention, more time to enjoy those delicious cookies!